There are a few VPN services that offer their own antivirus, one is Avira Phantom VPN Pro, which we looked at previously; Finland-based F-Secure is another. 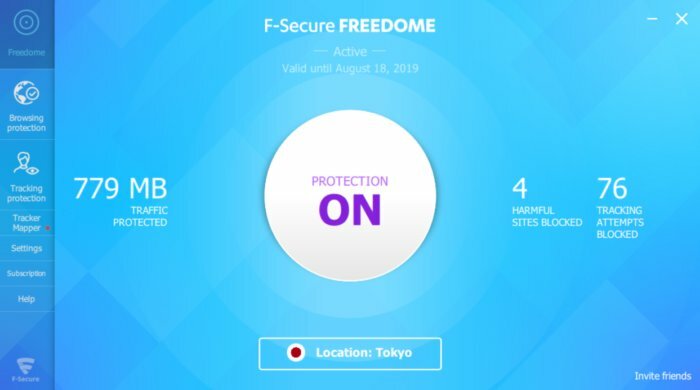 The company’s Freedome VPN is a premium service that offers 22 country locations around the world and extra freebies like tracker and malicious-site blocking. Freedome’s default view the first time it starts. Freedome on Windows offers a large, expansive interface that makes it easy for new users to navigate. 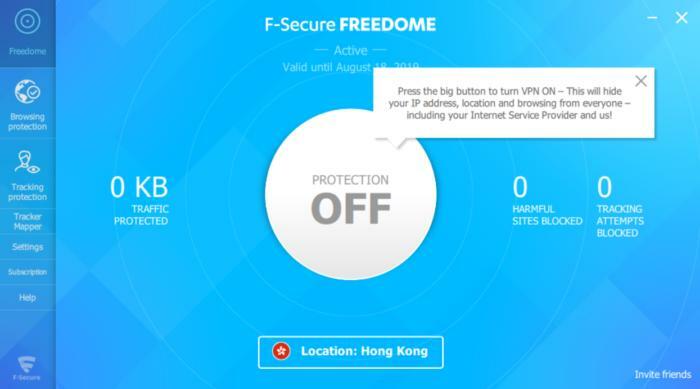 The primary dashboard features a big button in the center that says either “ON” or “OFF.” To the left of that is the amount of bandwidth you’ve used, and to the right there’s a count of the harmful sites and trackers Freedome has blocked. Below that is a rectangle showing your current country location target. Click it and a list comes up showing all the various country locations organized by continent. Pick the country location you want, and Freedome should start connecting right away. If it doesn’t, return to the main dashboard, click the button, and you’re away. Overall, it’s a very good starting point for new and experienced users. For most people, this is the only part of the app they’ll ever need. For those who don’t want Freedome blocking malicious sites or trackers, the two left rail options, Browsing protection and Tracking protection, can turn those features off; they are turned on by default. Freedome’s Tracker Mapper gives you a look at what tracks you online during a 24-hour period. Below those two options on the left rail is the Tracker Mapper. This is an educational tool for those who want to see just how much they’re being tracked online. The feature is similar to Mozilla’s Lightbeam project in that it shows all attempted tracking in an interactive visualization. 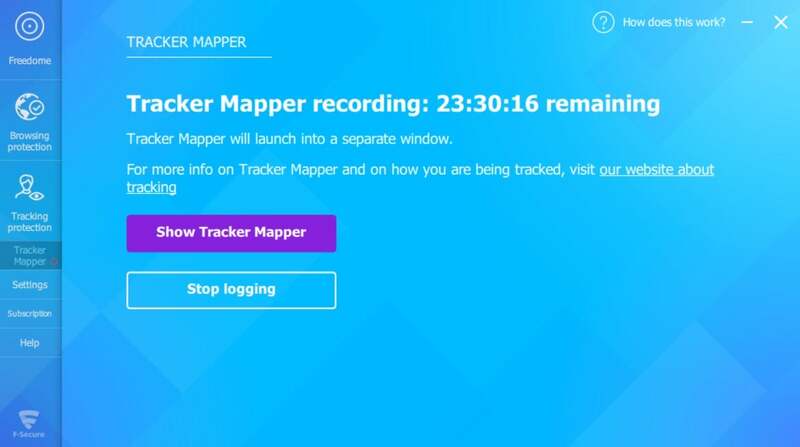 Activate this feature by clicking Show Tracker Mapper, which launches a separate window. Click Start a new log in the new window and the feature logs all the trackers you come across while browsing online. You’ll know it’s working when you see a red recording button at the top of the log window and in the left rail of the main dashboard. The log takes a full 24 hours to populate. The final section of Freedome is Settings in the left rail, which is very basic. If you’re an advanced user you won’t see options to change your VPN protocol or anything like that. There are options to start automatically at boot, activate the internet kill switch, and connect automatically at boot, but that’s about it. In my tests, Freedome didn’t help you access Netflix over a VPN, though it may work for other international services. Freedome is available for PC, Mac, Android, and iOS. The service costs $50 for one year covering three devices, $60 per year for five devices, and $80 for seven. Those prices are about average, with most VPNs covering five devices for about $60. It’s nice that Freedome offers a lower-cost option for those wishing to cover fewer devices. Freedome performed incredibly well in our speed test. It didn’t quite rise to the speeds we saw with HotSpot Shield, but it was still pretty great. Overall, based on five different locations around the world, Freedome retained nearly 51 percent of the base speed. All countries, including far-flung places like Japan and Australia, were well above 30Mbps. The base speed on the day of testing was 90.47Mbps. When you sign up for an F-Secure account, you start with a free, five-day trial. If you want to continue using Freedome, you pay at that point and then F-Secure sends you a product code. You don’t have to create an account or give F-Secure your name or email address. F-Secure accepts payments via credit card, PayPal, wire transfer, PayNearMe, and money order. F-Secure’s privacy policies for the VPN are interesting. It doesn’t read your web traffic, but it does analyze said traffic in order to filter malicious files, and it also scans the URLs you visit for filtering malicious activity. URL scans are checked via reputation lookups, and that data is not stored, F-Secure told me. If you decide to turn on the Tracker Mapper feature, however, the URLs are logged, and automatically deleted after three days. File scanning happens as a part of F-Secure’s “Security Cloud” feature. It only scans files sent over HTTP (not HTTPS) for safety. This service does not collect personal data, but files are stored for a time. 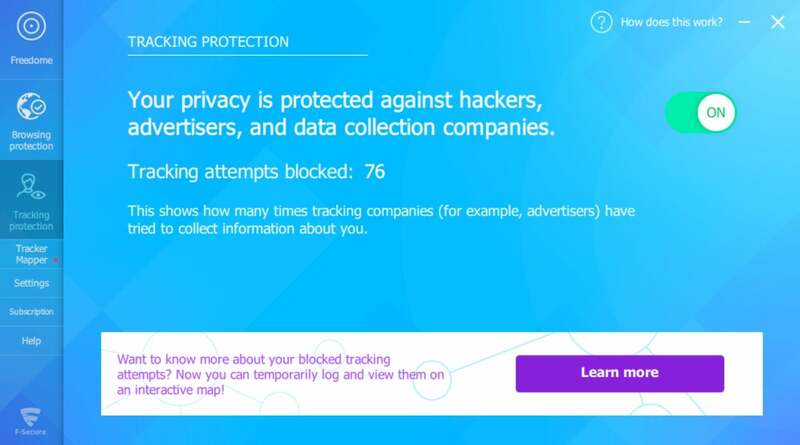 This feature, while not typical for a VPN, is common for antivirus programs. The service prevents P2P traffic, port scanning, and the use of unencrypted SMTP—a typical delivery vector for spam email. F-Secure will also “process” your bandwidth volume, country location, and IP address. These logs are stored for 90 days and then deleted. F-Secure is a highly trusted name in security and a well-known company. Its headquarters are located at Tammasaarenkatu 7, Helsinki, Finland. F-Secure’s President and CEO is Samu Konttinen and the CTO is Mika Ståhlberg. 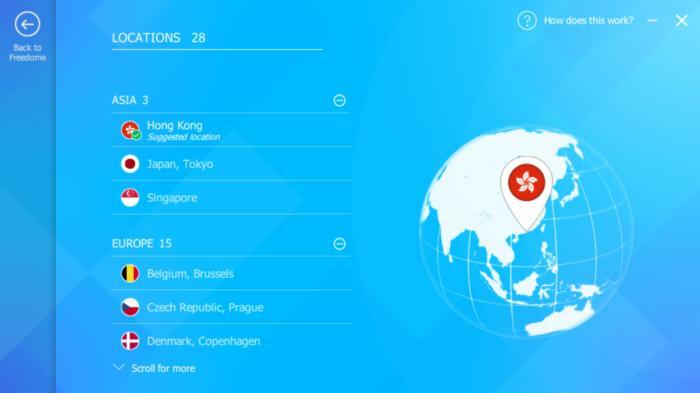 F-Secure is a very capable VPN with great speeds and a good, although not outstanding, number of country locations. Anyone who doesn’t like the idea of traffic logging and analysis may want to stay away as there are other VPNs that retain far fewer logs. If, however, you are looking for a secure VPN for everyday browsing and online activity then Freedome is a fine choice.